On Friday, Sept. 28 a hand-picked selection of 20 gynecologists, scientists, engineers, and entrepreneurs will converge on the campus of Massachusetts Institute of Technology (MIT) where they will each make a presentation at the Fourth Annual Open Endoscopy Forum, a three-day conference where endometriosis will take top-billing. Unlike the name suggests, thought-leaders and innovators in the gynecologic field will be en masse, not gastroenterology. Both co-founders of The Endometriosis Foundation of America, Padma Lakshmi, and Dr. Tamer Seckin will kick off the event by taking the stage with staggered presentations about their experiences with endometriosis. Lakshmi is a longtime endometriosis sufferer and outspoken women’s health advocate and activist. Seckin is an endometriosis excision surgeon with more than two decades of experience. "We always try to have someone who has some patient experience," says event chairwoman Linda Griffith, Ph.D., a Professor of Biological Engineering and Mechanical Engineering at MIT, of inviting Lakshmi. "She really stimulated me to think much more about that whole triad of patient-scientist-clinician, and how important it is to reach out to the lay public, to people who are not technical experts." 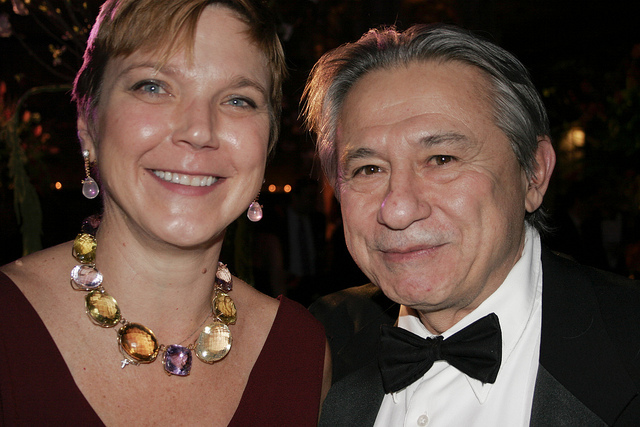 Dr. Tamer Seckin and Linda Griffith post together at the 2012 Blossom Ball in NYC. Earlier this week, MIT honored Lakshmi with the distinction of visiting scholar in the Center for Gynepathology Research. Griffith confides that her own lifelong battle with endometriosis led her to launch the center, where she and event co-chair Dr. Keith Isaacson have collaborated on endometriosis-related research together since 2009. It was there, she says, that she and Lakshmi became fast friends. "Her willingness to come to the lab and actually see the work being done in the lab, and think about the connections...from the young girls she thinks about all the time, in terms of raising awareness...and actually learning how we're trying to create new therapies and diagnostics. I think that's incredibly admirable." The decision to invite Seckin to speak came with just as much ease. "Dr. Seckin has an enormous record of accomplishment for getting people to think across the different lines of clinical expertise, patients and scientists," adds Griffith of Seckin whose presentation is titled "In Bed With The Beast." "We want everyone who speaks to be a really good speaker, someone who can convey a passionate message, and Dr. Seckin is certainly someone who can energize the crowd." Griffith says the conference will stray far from the typical buttoned-up format of many medical conferences and instead will be presented in a relaxed TED Talk-style. Griffith says the event will take place in an intimate setting with an audience of about 100. Registration is open to the public. Tickets and a schedule of events are available here.